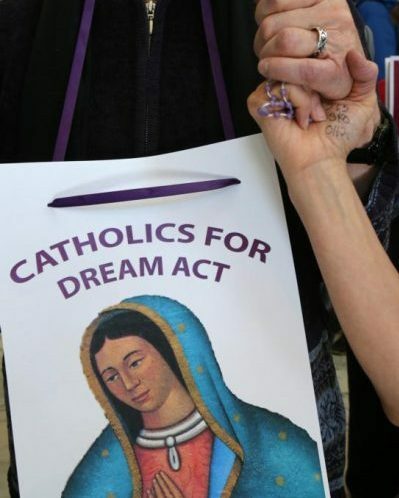 WASHINGTON (CNS) — As the once-feared March 5 deadline came and went, a bishop from the U.S.-Mexico border prayed with young adults in the streets of Washington just before they marched and chanted near the Washington Monument on the day President Donald Trump set as a deadline to end a program that keeps many of them in the country legally. The deadline was set to find a legislative solution to safeguard approximately 1.8 million young adults brought into the country illegally as minors, but it was rendered meaningless by legal challenges. Courts are now arguing whether the president had a legal right to end the Deferred Action for Childhood Arrivals, or DACA program. He advocated for asylum seekers and for immigrants who have been in the country for decades under a provision called Temporary Protected Status, which is about to expire. You are not acknowledging the vulnerable American citizens who are being harmed by mass immigration and illegal hiring. We should help better the conditions in the countries from which immigrants migrate, not bring them all here. And we should be an example of a nation whose government is ‘of the people, by the people, and for the people’ and encourage the people of other countries to fight for this freedom in their own country. You are doing a disservice to the citizens of this country by encouraging more illegal immigration and unfettered legal immigration that is destroying this country. We in the U.S. and elsewhere have sent our armies all over the world to fight different factions who are tearing up their countries and causing havoc. What is so different about the situations in Mexico and points south of there? Are these armed thugs causing havoc there?? The answer is = of course they are! SO, why are we (and others) not helping the good people take back their country(s)? To be a Catholic does not mean you have to be a PUSHOVER. There are a lot of people who will take advantage. God said, He helps those who help themselves. If we do nothing, the country will be full of people that are only in to be supported by those that work hard. And I do not want to support anyone on my back. I have a hard time even supporting myself.. People and countries should be RESPONSIBLE for themselves. There is no such thing as a freebie. Somebody pays for it. If the Bishops thing these people should be supported, they, the Bishops should support them. NOt the whole of society. America and Americans First. We need to take care of Americans. Dreamers are illegal aliens and should be sent home. Taxpayers are tired of paying for their schooling,housing,food and healthcare. No chain migration, their parents need to go home and make a family bond in Mexico and central America. They should take care of their own country. Since when does God support law breakers as illegal aliens do? If you don’t like the laws on the books then change them by legislation, Not accept the law breaking! Illegal alien immigration hurts legal US citizens by draining services reserved for legal Americans plus disrespects those that apply legally for admission to this nation. If immigration law can be dspespensed with then ALL US law can be dispensed with!